This is the first blog of a series that will specifically talk about Endurance Athlete Performance Nutrition and Supplements (EAPNS). I have been reading a book written by Dr. Feil, which unfortunately is only available in German, most of the information provided will be inspired by the boo. Today’s blog is a little out of sequence, but there was a specific need to extend on my favorite subject “CHEESE”. It took me a while to find a real good reason to eat cheese; cheese contains Chromium. Thus far I have only found out that there are differences in how much they contain, Edamer and Gouda (95 micro grams/100g) seem to be high on the list, as well as American Cheese. Other sources list all cheeses at 56 micro grams/100g. The daily needs of Chromium for adults are 35 microgram for men and 25 microgram for women, athletes and diabetics tend to have higher daily needs. The reason therefore is that Chromium is an essential nutrient that helps the body use sugar, protein, and fat. Daily intake beyond 200 micrograms can lead to health risks. A blog that specifically talks about Chromium will follow. On a side note wine and beer also contain considerable amounts of Chromium :). The fat content in the cheese impacts the flavor of the cheese, the community of cheese connoisseurs thinks that the fat content should be between 20-30% for ripened cheeses. 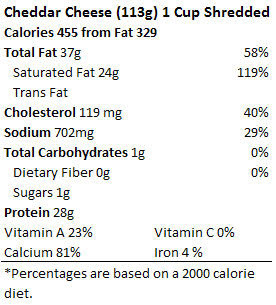 The biological value of protein in cheese is generally not as high as that in milk. Reason being is that the higher valuable whey protein is excluded in the process of cheese making. However, there are some repined cheeses that have up to 15 % whey protein, whereas most other cheeses only have 4-6% whey protein. On the plus side, ripened cheese also has a greater digestibility compared to milk (96-97% vs. 92%). Vitamin A and Calcium are of course valuable and should be considered as something positive when eating cheese.